The website of a Fashion outlet is the canvas which exhibits what exactly they offer. It has to look attractive to make the audience feel that a particular brand is better than others in the same industry. This is why an eye-catching website means a lot. Website design can greatly affect how things appear to the potential customers. One of the things that are kept in mind is the use of appropriate colors. Colors are psychologically connected to us and just a few right colors can divert much traffic to the website. One of the few influential colors that the Fashion industry loves to use is Black. Black is something that never goes out of Fashion and the Fashion websites do not underestimate its power. The famous websites that use black in their web design are Diesel, Prada, Sophie & Trey, Emploi New York, House, L’Exception and the list goes on. Diesel, the Italian clothing company, is known for selling high-priced denim jeans, and other clothing and accessories to the young adult market. Having everything from fragrances to clothes to shoes; they are one of the most renowned brand in their field. Looking through their website, you will come across a lot of black. The home page itself has a blackish background with models in black; giving it a black outlook. The vital pages, such as “Go to Online Store” and names of collections, are made into black as well. On the whole it has a black theme. You will get to know that when you browse through different sections. Prada specializes in ready-to-wear leather and fashion accessories. With a wide range of shoes, watches, perfumes, etc. ; it is known as the Italian Luxury Fashion House. On Prada’s homepage, the one color that will grab your attention is Black. The navigation bars, background and everything in the entire website is merged into the shades of Black. There is more black to be found once you start exploring about Prada. Sophie & Trey, another renowned fashion brand, which also believes in the use of black in its web design to make it appear eye-catching. With plenty of apparels and accessories to choose from, it is one of the most happening fashion collections in Florida. Sophie & trey use black navigation bars for different sections and product details with a white background and colorful elements. This mix of colors, balances out the impact of each color and gives out a sophisticated, yet a chic look to the website. Emploi New York is an awesomely customized wardrobe for working women. It is a favorite of everyone because it offers a comfortable and playful attire which easily transforms from an office to a night look. Again, black is cleverly used to highlight the sections which are important. The pages essential to make the customers shop something or another is when black is used to guide them through. This happens to be a Fashion Brand belonging to Poland. And it also comes in the list of the most fashionable websites. It is a store where one gets everything from clothes to shoes, whether it is a man or a woman, the collection is huge to choose from. The use of black is common in the web design of House’s website as well. All the details of products and different subdivisions are named in black. Keeping the background to white, black looks really catchy and is easily noticeable. 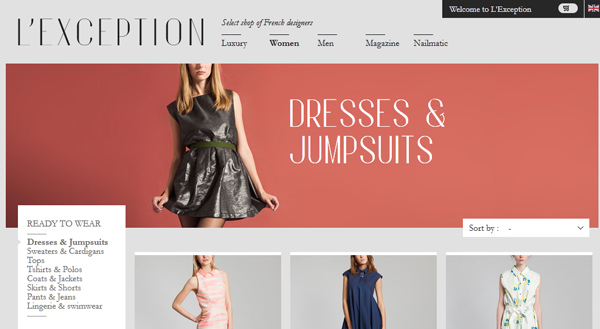 L’Exception, the luxurious brand which showcases cutting-edge selection of French designers. It gets you the collection of many award winning designers under a single-roof. The caption of the site “L’Exception”, and the titles of apparel segments are all in black. Black is therefore seen as an important element here because the rest of the website focuses on lighter and whiter shades. Using bright colors for navigation keys is a common practice to guide the visitors through the website. And as for Black, it is a bright and striking color. You hardly miss on anything that is Black. It gets noticed easily, thus stands out no matter what color it gets combined with. Black borders, captions and titles add an edge to the website. The website looks complete and professional. It is not just that the color that strikes us is what the websites choose, but there is also a meaning to every color that is used. And the meaning of Black is power, sophistication, contemporary style and night. All these meanings are important for the fashion industry as they portray fashion itself. And certain color combinations have their own meanings, for example; Black with White is innocence and purity, Black with Red is romance and passion, Black with Yellow is brightness and charm, and so on. Website designers know how to create an impact while choosing the right colors. Black is a timeless color, including it in a fashion website will make sure that your page will not get outdated. Black is pure and elegant. It contains a mysterious pull which draws us to it. And we automatically get mesmerized by its uniqueness.The trend of Black never goes out and you can keep it as long as you want to. One of the must-haves of web design trends is Black. When it is all about fashion, then why not opt for something which is fashionable in other industries as well? Websites do have their own trends, a particular design, color, shapes, technical elements, etc. And the latest website design trends include the use of black. Being a fashion website one does think about trends in every way. Black seems amazing to grab attention of the target audience of the fashion business. Black is a decent and trendy color, it suits all types of audiences. From teenage to old age, black is involved in the lives of each one of them. It is graceful and calm, yet bold and edgy. All age groups do connect to the color and consequently it is a wise decision to hold on to black. Black completes everything. It seems as black is there for the finishing and the styling act. It fills the gap and shapes up the design. Black has to be somehow and somewhere to make things look finished and fine. The power of black for Fashion industry is immense. Whether it is a website or a piece of clothing, they do see black as a necessity. Including black in a fashion website is certainly a worthy decision.